1 hour from Toulouse. 1.5 hours from Carcassonne. Easy access to many attractions & the high Pyrenees. 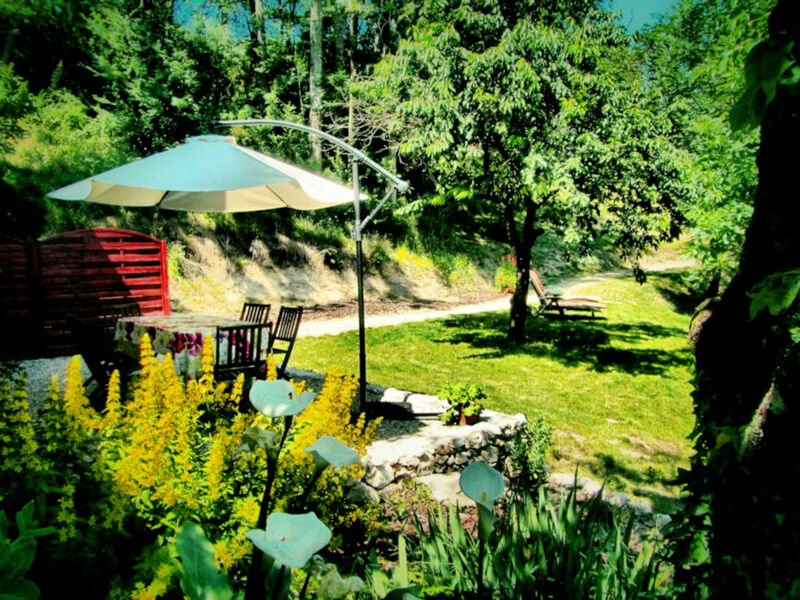 Peaceful Apartment in the foothills of the Pyrenees. South of Toulouse. Sleeps 4. All New Facilities. Free Wi-Fi. From 400 Euros per week. Flexible changeovers except Jul/Aug. Price includes linen, bedding & cleaning. Family-friendly but pets not accepted, sorry. A twin bedroom & a double bed on the mezzanine. There is a large separate shower room with a wash basin & WC, accessible from the mezzanine & the twin room. There are windows with shutters on the mezzanine first floor & in the bedroom plus 2 large sets of French windows on the ground floor. In the large open plan salon is a new fitted kitchen. There is a wood burning stove, comfy seating, TV + DVD's but no television channels! There is Wi-Fi. Sun loungers & a BBQ are available for your sole use. An initial supply of wood is provided during the winter months. Electricity is included but if extra heating is required then some extra charges may apply, depending on the duration of stay, weather conditions, etc. The gite is spacious, comfortably sleeping 4 adults. We can offer 2 or 3 additional beds for children, creating flexible family accommodation. Please do ask about options? Outside of the High Season we can be very flexible on arrival dates, length of stay, etc. We are located in the foothills of the Pyrenees near the pretty village of Sieuras close to the famous Bastide artists' village of Carla Bayle, 40 minutes south of Toulouse, in the Midi-Pyrenees. Our newly renovated accommodation is at one end of our home; it is entirely self-contained with separate gardens & parking for your sole use. We are ideally located for exploring the Ariege. The high mountains, with a broad choice of exciting outdoor activities, are about 30 minutes drive. Impressive Cathar castles perched on high crags, medieval towns & villages with colourful markets, huge caves, underground rivers all lie within easy reach. There is a swimming lake (with lifeguard) within 10 minutes drive. A supermarket (plus other amenities) & a 'Boulangerie-pâtisserie' are also within a 10 min drive. We have lived in the area for 9 years. We are keen walkers & bird watchers; we hike, snowshoe in the mountains most weekends. We use the refuges and wild camp. We assist in professionally led 'Chemin de la Liberte' Freedom Trail treks over the border into Spain. Cycling is very popular, with many routes in the local area. We can provide secure storage. There is an excellent fishing lake nearby and numerous mountain lakes where seasonal fishing is permitted. We also have 2 children (13 & 14) so we are adept at entertaining the younger ones & encouraging them to enjoy the great outdoors! As you may have noticed, we do have a friendly dog, Tiffi, and 2 cats. None are allowed in the guest accommodation! The Ariege has a huge amount to offer, not just the magnificent mountain scenery, but also it's fascinating history, rich culture, diverse wildlife & great food. Please do contact us to find out more & to discuss your own ideas & requirements? Unfortunately our Gite is not suitable for anyone with reduced mobility. From 400 to 580 Euros per week. Changeover Sat to Sat in High Season (July & August). Rates, duration & arrival days can be negotiated outside High Season. Weekend rate: 180 Euros (min 2 nights).